Touching base with your local cancer support group and daffodil centre in my opinion is highly important. They are fantastic outlets where you can feel you are acquiring an extra beam of support. If I hadn’t gotten in contact with the Irish Cancer Society I would have never found out about the Look Good Feel Better programme. It all began in 1987 in the US, when a physician asked Ed Kavanaugh, Personal Care Products Council President at the time, to provide a makeover for a woman that was massively suffering from the self-confidence issues that arise from the visual side effects associated with chemotherapy. This woman was highly depressed and wouldn’t leave her room, she hated the way she looked and that made her self-confidence plummet. Kavanaugh arranged for a beautician to visit her along with organising the donation of cosmetic products. What happened next created the basis for the Look Good Feel Better programme. After the makeover this woman felt like herself again, she felt fantastic on the outside which in turn caused a massive jump in her confidence, making her feel she could tackle the world again. After seeing the massive change in this woman, Kavanaugh, with the aid of the American Cancer Society, established the Look Good Feel Better Programme. It is now in twenty six countries worldwide. The programme is currently run in thirteen hospitals around Ireland so there is sure to be a workshop near you. I wasn’t sure what to expect, only being told to wear little make-up as I would leave looking glamorous. A group of around ten women including myself were guided by a lovely daffodil centre volunteer into a conference room in St. James Hospital where it had been transformed into a beauty salon. The table was set out with mirrors, accessories to help with make- up application and a goody bag each. Three beauticians, who took time out of their own schedule, spent two hours showing us how to apply make-up from beginning to end. They were extremely pleasant and helpful. I felt I could ask anything without being embarrassed. After all they were there to help you help yourself. We started from basic skincare and moved on to applying foundation, eye shadow, blusher etc. They focused on creating a natural day time look but showed us the necessary skills needed to create a mysterious night time look. 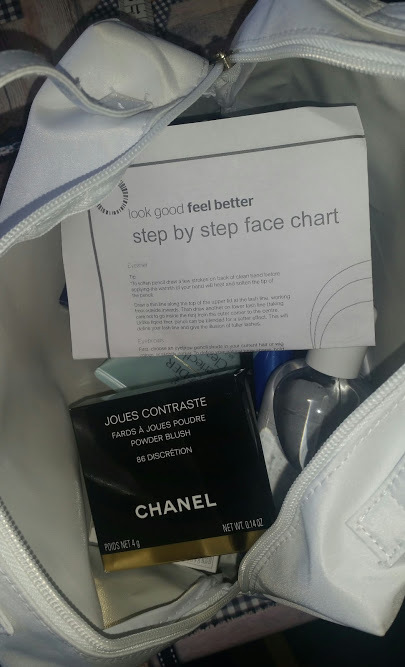 The goody bag provided a generous amount of cosmetics ranging from BB cream, foundation, eyebrow pencils to a blusher. I was really taken aback by the kindness exhibited. It was such a relaxing day, with women from all walks of life present. Some were in their nightgowns simply escaping from the ward for a couple of hours, and others just popping in for the workshop, wearing fantastic wigs that made my jaw drop when I found out they were fake. Speaking of wigs a hair loss specialist from Roches also came in to show us the different types of wigs and associated accessories available. It was a safe space, all of us on a similar path, simply wishing to feel an ounce of normalcy. Feeling you are not alone in all of this is a calming feeling and sharing tips and hints could take you a long way. One suggestion I may make is if you have a handy little cosmetic bag you could bring along your own make up that works for you and feels right for you. No doubt the goody bag they give provides everything but just in case you have a go to foundation and want tips on how to apply it flawlessly, this is the time. If you haven’t been or are a little reluctant to go because perhaps you may not have a lot of experience with make-up don’t fret, this is exactly the place for you. It takes at most three hours of your life and you will leave feeling invigorated and ready to walk down that runway. Knowledge is power. To get information about your nearest workshop and times contact your nearest Daffodil Centre, ring 01 8734996 or email info@lookgoodfeelbetter.ie. Step away from the shaver Sarah!